Construction jobsites are getting smarter. From cell phones to connected equipment to virtual reality, implemented technology is streamlining processes, helping utilize resources more efficiently and making these areas safer. However, many of the solutions work with only one department, such as accounting or maintenance, and do not communicate with each other. This lack of integration could slow down workflows (defined by Merriam-Webster as the sequence of steps involved in moving from the beginning to the end of a work process). By employing a cloud-based solution to “collect, aggregate, process and analyze data from hundreds, thousands or even millions of internet-connected objects”, contractors can take another step towards better collaboration and better profits. Yet, where do you begin? One simple way is to make sure any software used is accessible on a phone or tablet for data entry or pulling reports and work orders. 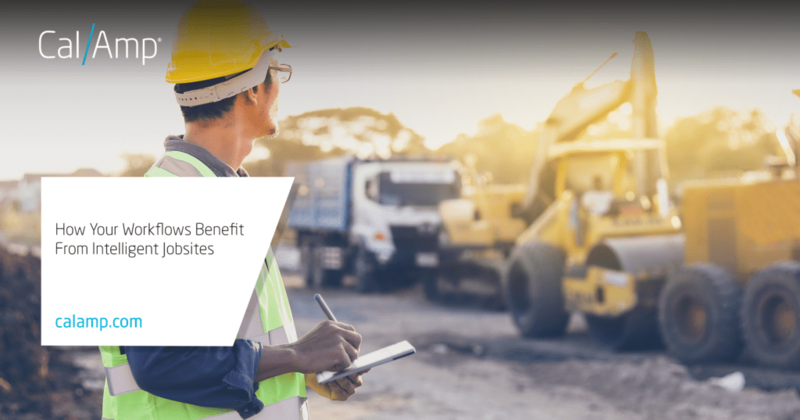 Another step toward an intelligent jobsite is connecting and empowering your assets. The data you tap into helps you use them efficiently and even improves some workflows. Asset telematics provides valuable insights into location and utilization. You might not consider knowing the location of an asset as important until you need to find a particular piece of heavy equipment quickly or want to know how many skid steers are in use so you can redeploy one. The mapping function of a solution, like AssetOutlook™, lets managers view equipment or groups of equipment while providing location-based analytics. This attribute helps you keep track of resources across a large jobsite or multiple locations and how they are being utilized with the breadcrumb details. The information lets you better balance your fleet size and operations. Knowing when to arrange maintenance or when repairs need to be made allows you to plan for when an asset will be in the shop. This keeps breakdowns to a minimum and keeps your projects stay on schedule. The data for these decisions comes in part from access to engine hours, idle time, fuel consumption and more. Telematics is moving upkeep from reactive to proactive– where the equipment almost automatically schedules its own maintenance. Some machines are ideal for full-automation of repetitive or dangerous tasks. In the near future, the equipment could navigate the terrain by having a current asset location, communicating with drones and relating that data to Esri maps. Today, contractors use drones separately to create topographical maps to supplement traditional surveying methods. Moreover, intelligent machines help operators follow programmed designs or processes to complete tasks using 3D renderings and automatic grade-control systems. Telematics connections and add-on sensors assist by providing data on weight loads, idling, hydraulics and more. The benefit is safer working conditions for the crew and more efficient operations of projects and equipment. Intelligent jobsites are about having the information from various sources in real-time to make actionable and adaptable decisions. Connectivity between the field and back office improves communication and reduces manual processes for better workflows, invoicing, equipment management, safety and more. Cloud-based telematics solutions are an important part of helping make your operations smarter by integrating and tapping into the data of assets.